The event is known for its elegant parties and over-the-top fashion, culminating in the Opening Day Hats Contest. The Party on Opening Day includes stretch run admission, access to the Seaside Cabana and Red Bull Tour Bus, gourmet food trucks, private wagering and a beer garden and cocktail bar for $30 per person. Want a reserved seat? Shaded stretch run seats and trackside dining tables are available from $25 to $65 per person. 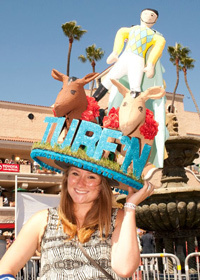 This year, the racing season extends to Sept. 7 and several events are scheduled throughout summer to celebrate: The family-friendly Donuts at Del Mar on July 18 and Webkinz plush horse giveaway July 19; Del Mar Craft Beer Festival on July 25 and Aug. 29; the elite $1 million TVG Pacific Classic on Aug. 22; and several evening concerts featuring The Wallflowers, Thievery Corporation, Weezer and Ziggy Marley. For a complete event schedule and ticket information, visit dmtc.com. • In case you missed the big news, Bracero Cocina de Raiz, the latest project by Baja celebrity chef Javier Plascencia, opened Thursday in Little Italy, roughly a month after the initial planned opening. A menu preview posted on Scribd shows several raw plates highlighting Baja-style seafood, such as chocolata clams and Sea of Cortez scallops; tacos stuffed with fideo (angel hair pasta); lamb asado roasted in a Caja China box and butter-fried escamoles (ant larvae) — a delicacy long consumed in central Mexico. Taking up two floors in the Ariel Suites building on Kettner Boulevard, the first floor will have a cocktail bar and patio with seating on a first-come, first-served basis. Reservations are required for the second floor and can be booked through the restaurant's website. As of press time, the next available table for two is on July 27. • Sovereign Kitchen & Bar is now serving Vietnamese food in the Gaslamp Quarter prepared by chef Michael Huynh, who won “Iron Chef Vietnam” and has been honored by Michelin. The upscale restaurant has several authentic Vietnamese dishes, such as clay pot chicken, baked or fried whole fish, thit kho (caramelized pork belly), bo la lat (beef wrapped in betel leaves and grilled) and Vietnamese crepes. • Civico 1845 is a new Italian restaurant that replaced Zia’s Bistro on India Street and is owned by brothers Dario and Pietro Gallo, who recently moved to San Diego from southern Italy. Aside from a wide prosciutto and cheese selection, homemade pastas, breads and meat dishes, the restaurant has several vegan entrees and desserts — a rare find in an Italian restaurant. “Most people read ‘marinara sauce’ and think tomatoes, which are vegan-friendly. What they don’t realize is that the sauce is often made with butter, which is not vegan at all,” Pietro, who is vegan himself, said in a news release. • Also new to Little Italy is Sorrento Ristorante, Bar e Pizzeria, replacing La Villa, which owners Little Italy Restaurant Group closed last year. Sorrento remains under the same ownership (the company also operates Buon Appetito and Sogno Di Vino) and focuses on the cuisine of its namesake coastal town in southern Italy. The menu features lots of seafood dishes — octopus carpaccio; swordfish; black linguine with shrimp, scallops and leeks — Neapolitan pizzas and Italian wines. Gluten-free and vegetarian options are also available. • The former Western Steakburger space on University Avenue in North Park has been transformed into Breakfast Republic. Owner Johan Engman, who operates three Fig Tree Café locations and Café Cantata in Del Mar, brings breakfast to a part of town that is dominated by craft beer bars and gastropubs. Along with traditional morning meals of Benedicts, omelettes and pancakes, diners can start their day with jambalaya, breakfast bacon mac ’n’ cheese, a Vietnamese chicken wing bowl or a beer-and-sausage sampler. And because this is North Park, 20 craft beers are available on tap, as well as kombucha and “antioxidant shots” of fresh juices. • Galaxy Taco, a new project by the owners of George’s at the Cove, is opening Monday a few blocks from La Jolla Shores. Executive chef and partner Trey Foshee developed a menu concept that respects tradition, but includes his own spin on Baja cuisine. Masa for tortillas will be made daily from scratch using a $10,000 corn grinder that was custom-made for the restaurant, and only non-GMO corn sourced from small farms in Mexico will be used. Tacos range from fried fish to lamb barbacoa and Foshee’s special “The Tacolandia” — pork shoulder topped with cabbage-jalapeno slaw and pig ears. Diners can also opt for a tasting menu that includes a choice of ceviche, one taco, a Modelo Especial and shot of mescal for $28. The city of Oceanside is celebrating its burgeoning restaurant scene with a new food festival and fundraiser on July 15. Called “FEAST,” more than a dozen vendors, breweries and distilleries will gather at Old Mission San Luis Rey, the largest mission in California which dates back to 1798. Attendees get to choose which local nonprofit will benefit from their ticket purchase, and have the option to participate in a silent auction and raffle. Some of the participating area restaurants include Master’s Kitchen & Cocktail, Panca Peruvian Cuisine & Rotisserie, Privateer Coal Fire Pizza, Flying Pig Pub & Kitchen and more. Tickets are $45 per person; the event is from 6-9 p.m. For a complete vendor list and ticket information, visit http://mslrfeast.com.